Before we start: he’s wearing wings because he’s going to a costume party. 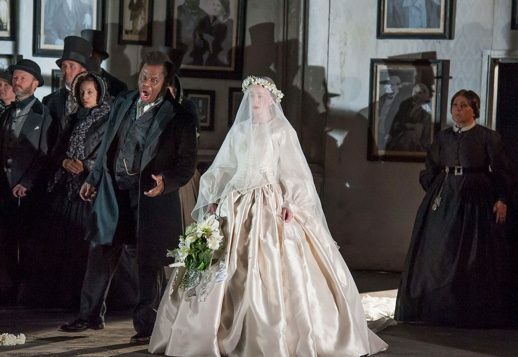 Now that the question which perennially occurs to the hard of thinking whenever David Alden is mentioned has been dealt with, we can talk about his ENO production of Lucia di Lammermoor without being interrupted. It’s not a new production: it first appeared in 2008. But it reflects some of the themes which have permeated the director’s work in recent years, particularly where the design is concerned. It has the stark, austere, off-white aesthetic of his Met Ballo, and like his Semiramide for Munich and Covent Garden, location is suggested by a series of alterations to a basic set, rather than pictorially represented. Like most directors of this opera this century, Alden is keen to outline the helplessness of women in the face of 19th century patriarchy. We first sense this during the staged overture (five points on your Hater’s Bingo card) where Lucia, in a prison-like metal bed on wheels which echoes a crib, wakes from a nightmare and is spun aggressively around the stage by Enrico. The basic set, variations of which we are presented with over the course of the evening, resembles a late Victorian British institution of some kind: a school, maybe, or a hospital or, maybe, an asylum. Severe portraits of ancestral forebears dot the walls, which in illustration of the Ashtons’ financial need, are pasted with peeling wallpaper. Once the opera proper began, a sense of foreboding took hold and never let go. In a hugely impressive ENO debut, Harewood Artist Elgan Llyr Thomas presented a Normanno so oily you could have dressed a salad with him. Crowding in outside the windows, the chorus were fervent in their desire to do whatever they were told (“Lock her up?&#8221😉 and Lester Lynch’s Enrico was clearly not going to be a mollifying influence. In Lynch and Alden’s hands, the character was a great deal madder than his sister from the get-go. Where Sarah Tynan’s Lucia avoided the doom-laden, foreshadowing waif we often see in her opening scene, presenting instead a joyful, innocent character so precocious that she jumped onto a school-hall-like stage to perform &#8220;Quando rapito in estasi&8221; to her dolls, Lynch was clearly in need of the white coats from the start. This Enrico obsessively plays with toys and stares at photographs of Mother. There are strong hints that he has sexually abused his sister. When he brandishes a gun during the sextet, it’s unclear whether he intends to use it on Edgardo, Lucia… or himself. Lynch committed unflinchingly to this portrayal, which makes a kind of sense when you consider the handbrake-turns Donizetti and Cammorano expect of the singer. As written, Enrico veers from sociopathic selfishness to murderous rage to sudden remorse to self-justification, so the unhinged individual of this production has a paradoxical logic to him. And a further twist was added at the end: entering the final scene and witnessing his rival’s death, this Enrico had an unmistakable air of triumph. Vocally Lynch has the kind of voice that demands attention from the first note: a big, dark-hued, crunchy baritone. Early on in the evening he seemed to be prioritizing size and volume over everything else—at times in &8220;Cruda, funesta smania,&8221; he was forced to take choppy breaths in the middle of phrases, which didn’t help the old legato much. But after this edgy start, he produced some top-quality Italianate baritoning, and Italianate baritones don’t grow on alberi. Clive Bayley as Raimondo gave us a truly memorable character study in weakness and hypocrisy. Reminding us that the devil can cite scripture for his purpose, Bayley’s sepulchral, sonorous bass added an extra layer of creepiness to a man who in this production is every bit as culpable as the people he ends up blaming, and knows it. This was a man hiding behind a pretence of piety in order to manipulate people into giving him what he wanted, and thank goodness we don’t have men like that any more, eh, readers? He took nervous swigs from a hip flask at the wedding, perhaps already realising that his pompous, sanctimonious lecturing of Lucia might have set her on a path to disaster (during his aria, Lucia was prepared for her wedding dress by being stripped to her underskirt, which was hooped both horizontally and vertically; a cage). His denunciation of Normanno at the end seemed just to be a question of rounding on the nearest, most convenient source of blame, but staring at his hands, Bayley left us in no doubt he was really talking to himself. Michael Colvin was given a peach of an entrance as Arturo, seemingly costumed as Siegfried. And Roy. With a cigarette holder almost as long as his silver-topped cane, this Arturo was instantly, comically unsuitable and Colvin relished the chance to demonstrate it. The curtain fell on the first half with him crushing one hand over Lucia’s face while the other grabbed what we shall euphemistically call her lower bodice. Eleazar Rodriguez. Write that name down because he’s something special. His Edgardo was near-perfectly sung, full of sap and ring and ping and all the strange monosyllables which describe a vocally exciting tenor performance. He’s a good-looking lad (important in a production which insists on putting Edgardo in a kilt, the only real suggestion all night that we were in Scotland. It’s a dream that will never happen, but I think if you’re going to perform this opera in English at least a suggestion of the accent from someone might be nice) and although the character isn’t called upon to do much other than &8220;I am in love,&8221; &8220;I am sad&8221; and &8220;I am angry&8221; he credibly embodied all the primary-color emotions required of him. He even managed to make the final scene something other than the after-the-Lord-Mayor’s-Show anticlimax it can so often be: the voice was still as fresh as at the beginning of the evening, and he brought some thrilling singing to what is a cruelly demanding scene. He’s still firmly in the lyric tenor category at the moment, but there are also tantalizing hints of steel to come. None of the climaxes of the role fazed him at all, not even the one I always dread since that awful moment at the Met when the Noted Vivaldi Baritone’s voice deserted him completely. Rodriguez, from Mexico via the Young Artists Program at San Francisco, seems to have been a company member at Karlsruhe for the last few years, working his way through Taminos, Belmontes, Nemorinos. Lucky Karlsruhe. Or not so lucky: they must be resigned to losing him, and soon. Tynan, astonishingly only the second ever Lucia at this address (this production, when new, was ENO’s first, so only Anna Christy has ever sung the role at the Coli before) came about as close to giving a &8220;star is born&8221; performance as it’s possible to get without quite getting there. 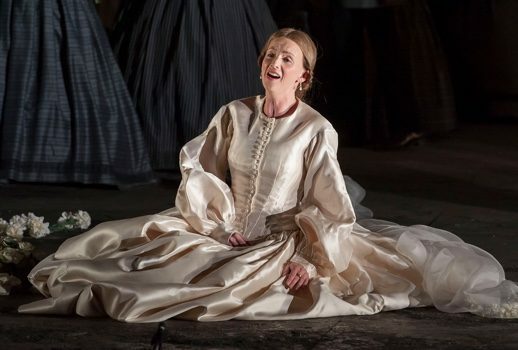 There’s been a buzz about this singer for a while- certainly I remember a lot of excitement about her Sophie in the last ENO Rosenkavalier, excitement she delivered on with a gloriously sung performance. To reach for cliché, she really is incapable of making an ugly sound. The voice isn’t particularly Italian-sounding—perhaps I was influenced by the location, but Valerie Masterson came to mind, although Tynan’s basic tone is even lovelier—and she’s come to Lucia via what seems an unusual route these days. She’s neither a Zerbinetta getting serious, nor is this a stepping stone on the way to Bolena: she’s a lyric soprano who isn’t going to make a career in the coloratura rep, either leggiera or dramatic. So the payoff for the beauty of tone was that the acuti aren’t the glory of the voice. But they’re all there, and they always meant something—sometimes a cry of terror, sometimes a defence, sometimes despair. Her characterization, as mentioned above, was sunnier than the average Lucia, to begin with at least. She was optimistic, charming, likeable. By Act 2 she showed us with great clarity how that optimism had been beaten out of her, but that a certain defiance remained. By the mad scene she was broken, to arresting effect in the first section, which was greeted by a pin-drop silence in the house throughout. (Anyone who ever tries to do this scene without a glass harmonica, by the way, I will find you and I will break one over your head). The sense of horror was heightened by a pair of theatrical coups: firstly, the curtain of the school-hall stage opening to reveal Arturo’s bloodied corpse, and then Tynan wrapping herself in the corpse’s arms as she sang the &8220;Alfin son tua&8221; section. This chilling moment would doubtless have worked even better if it hadn’t been comprehensively spoilered by a photo in the programme of Christy at the same moment, and really, can publicity departments not? For all that it’s beleaguered in other ways, ENO does seem to be knocking it out of the park in the casting department. For example, the last four leading ladies I’ve seen there have been Corinne Winters, Latonia Moore, Sasha Cooke and Tynan, all four of them world-class singers, luxurious for a &8220;second&8221; house, and maintaining a balance between giving the audience established stars, introducing up-and-coming international talent, and nurturing locals. That’s the golden ratio, right? My only caveat about Tynan’s gorgeously sung, truthfully portrayed Lucia was that right at the end I missed a spark of… can I say dementia? This production aims very much for a catatonic, denial-based kind of madness, and maybe I’m cheap, but I want more horror, for it to go to the dark place more. It doesn’t have to be Mosuc self-harming or Dessay twitching (although both of those are stunning) but I want something a little more disturbing from my mad scene. At the very least I want to get goose bumps on &8220;il fantasma,&8221; and they weren’t present here. But that’s a personal preference and shouldn’t take away from what was otherwise a triumphantly conceived performance, impressive dramatically and near-flawless vocally. The star is born moment isn’t far off, I think: the star’s mum is certainly past the twelve-week scan. Stuart Stratford, in the pit, did have a star-quality night. Pacing was fluid and idiomatic, climaxes powerful, and he gave the score a tone-poem quality by finding all kinds of orchestral moods. The band insinuated, cajoled, contradicted. Any conductor who can elicit the sound of irony from an orchestra is a conductor worth listening to. But none of these elements would have been able to make a truly satisfying evening were it not for Alden’s intelligent, detailed production. As I noted when reviewing his Semiramide, he is brilliant at filling a stage with movement, without that movement ever becoming distracting or irrelevant (well, apart from maybe one moment when Pring is asked to open and then close the tabs on the stage-within-a-stage, maintaining a look of doom-laden horror throughout, which was a moment of the purest, Sontagest camp). He always uses a chorus brilliantly. The chorus here is utterly complicit in Lucia’s destruction. They’re bloodthirsty to a fault—even before the news of Arturo’s murder, the wedding has degenerated into a drunken brawl, to the delight of the onlookers. 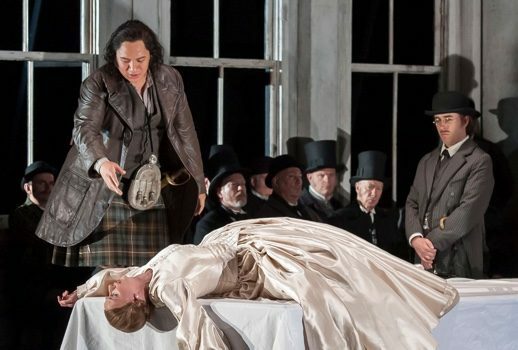 And, as in Stefan Herheim’s Glyndebourne Pelleas, they remind us of our complicity too. During the mad scene, they sit as an audience in front of the small stage where Lucia is singing. But although they’re referring to her, they’re looking at us. At the end of the first section, they applaud in slow-motion dumb show, right at the moment we were about to applaud. It’s hard not to come away from an opera like this without thinking &8220;wasn’t the nineteenth century AWFUL?&8221; The men we’re encouraged to think of as our romantic heroes—Edgardo, Alfredo, Manrico—they’re all very quick to offer up an eternal curse to their womenfolk at the slightest hint of impropriety. The only decent one of the whole lot is Radamès, and even he’s not to be trusted with a secret. The fate of women at the time seems encapsulated by the fact that Lucia isn’t just thrown to the floor by her brother, but by her lover too. But to his credit, Alden doesn’t stage this opera as a museum piece, nor does he fall back on simple, broad-brush condemnations of the past. This is not a production one leaves feeling complacent or superior. It’s a production that reminds us that, whether in the 1680s, the 1860s or the 2010s, among the constants of human life are men’s destruction of women, and the onlookers of all genders who allow it to happen.